The value of construction projects in Cambodia rose more than 22 percent to $6.4 billion in 2017 from the previous year, according to official figures released Tuesday that showed the impact of a boom driven by Chinese investors. The Ministry of Land Management, Urban Planning and Construction said it approved a total of 3,052 projects, covering more than 10 million square meters (108 million square feet) last year. The ministry did not give a breakdown by residential and commercial projects, nor did it give the nationality of the developers. 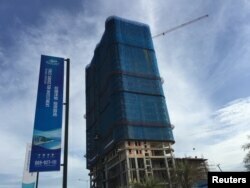 But the high level of Chinese investment is evident from the skyscrapers that have shot up with apartments and condominiums in Phnom Penh, and the hotels and casinos being built to serve Chinese buyers in the resort city of Sihanoukville. Many of the apartments and condominiums were being built for Chinese investors, said Chrek Soknim, CEO of real estate firm Century21 Mekong. FILE - A Chinese Blue bay resort under construction is seen at the Preah Sihanoukville province, Cambodia, Nov. 26, 2017. "People who buy these properties don't live here, they buy as investments," he told Reuters. China's Prince Real Estate and Yue Tai Group were both scheduled to launch major projects in 2018, said Tom O'Sullivan, CEO of realestate.com.kh. But he added there was a growing market for local buyers too, with condominium sales in the $22,000 to $90,000 range. "The reality is that Phnom Penh needs more homes to cater for the middle-income earner," he said. Political turbulence last year had little impact on investment, property specialists said. Cambodia's main opposition party was banned after the arrest of its leader, Kem Sokha, on treason charges he says were politically motivated to eliminate him from an election in 2018. Despite criticism from Western donors of Prime Minister Hun Sen's government for its moves against the opposition, China has stood beside Cambodia. Chinese Prime Minister Li Peng signed a raft of new aid and investment deals in Phnom Penh last week. "Chinese investors are not concerned about the upcoming election," O'Sullivan said. There has been little open opposition to the growing Chinese presence in Cambodia. But in a rare sign of friction, Cambodian police arrested 74 Chinese nationals who had been working on a condominium project in Phnom Penh. Uk Heisela, chief of investigation at the immigration department, said they were suspected of working without permits and staying illegally.